2. The signal flow graph of a system is shown in figure. 1. In the system shown below, x(t) = (sint).u(t). The input – output transfer function of a plant H(s) = 100/s(s+10)2. The plant is placed in a unity negative feedback configuration as shown in figure below. 2. Consider the state space system expressed by the signal flow diagram shown in the figure. 3. Consider the following block diagram in the figure. the frequency response data for the system are given in the following table. 5. The position control of a DC servo-motor is given in the figure. The values of the parameters are KT = 1 N-mA, Ra = 1 ohm, La = 0.1 H, J = 5 kg-m2, B = 1 N-m/(rad/sec) and Kb = 1 volt/(rad/sec). d is _______. 1. Which one of the following polar diagrams corresponds to a lag network? 1. A control system with a PD controller is shown in the figure. 1. Group – I gives two possible choices for the impedance Z in the diagram. The circuit elements in Z satisfy the condition R2C2>R1C1. The transfer function Vo/V1 represents a kind of controller. 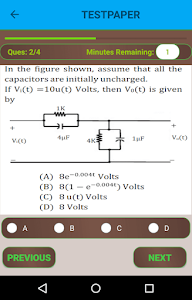 Match the impedance's in Group – I with the types of controllers in Group – II. 1. The magnitude plot of a rational transfer function G(s) with real coefficients is shown below. Which of the following compensator has such a magnitude plot? The transfer function of a compensator is given as Gc(s)= (s+a)/(s+b). 7. The approximate Bode magnitude plot of a minimum phase system is shown in figure. 3. Consider the Bode magnitude plot shown in figure. 7. The asymptotic Bode plot of a transfer function is as shown in figure. 1. The Bode plot of a transfer function G(s) is shown in the figure below. 11. The Bode asymptotic magnitude plot of a minimum phase system is shown in the figure. 18. In a Bode magnitude plot, which one of the following slopes would be exhibited at high frequencies by a 4th order all pole system? 14. Consider the Bode plot shown in figure. 1. Consider the network graph shown in figure. Which one of the following is NOT a ‘tree’ of this group?